Get adorable Pusheen goodies delivered to your doorstep! Pusheen Box ships every 3 months, and all of the items inside are custom-made just for the box. You can’t get these officially-licensed, fun and functional exclusives anywhere else. This beautiful Totoro necklace is handmade with love from polymer clay! 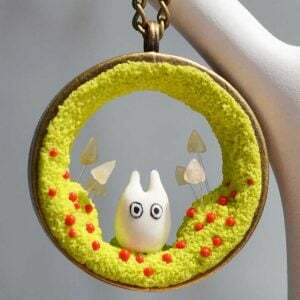 The pendant includes a miniature Totoro, mushrooms and berries in the finest of detail and comes with a long chain. The perfect gift for your significant other. Giving your sushi the right amount of soy sauce can often be a difficult task! This magical spray bottle completely eliminates the problem of bad dipping experiences. Equally covers the whole surface of the food, giving it the perfect amount of saltiness. Power up your look with these kawaii Super Mario charms! Each necklace or set of earrings features original artwork printed onto clear acrylic. Keep your favorite items close by until you’re in a desperate or dangerous situation! Upgrade your in house wardrobe equal to that of Umaru-chan’s, with your very own animal hooded cloak! Now you can sleep, game, watch TV and binge out on all your favorite snacks in total cuteness just like Umaru. Tell time with the help of your friendly neighbor Totoro! This cute alarm clock features everybody’s favorite forest spirit with the clock face incorporated into his belly. Makes a fun decoration for the office or a great way to get up in the morning! Express your Ghibli pride with a combination of your favorite foods and characters! 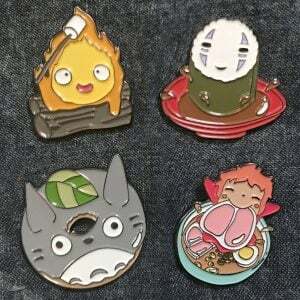 Each of these fan made pins come in a parody of your favorite Studio Ghibli characters, mashed up with delicious snacks and treats. Increase the cuteness factor of any room in the house tenfold with this adorable Hello Kitty rug! This kawaii addition to any home will bring a sweet feeling of warmth and comfort to the feet of any Hello Kitty lover. Keep your stationary in order in the cutest way possible! This stylish pen holder comes modelled after everybody’s favourite feline, Hello Kitty! Perfect for keeping your desk tidy and all your important items organised. Gobble up sushi like a Samurai warrior these miniature katana chopsticks! Each set comes as a detailed pair of pint-sized swords, allowing you to swiftly stuff your mouth with food and surprise dinner guests. Turn any little fur ball into a walking, four-legged piece of nigiri! Your dog will look cute enough to eat with chopsticks once they’re dressed up in this hilarious sushi costume. Available in many different sizes to fit any pet. Make a splash on hot days with these goldfish shaped ice cubes! This fun and flexible party ice tray makes eight perfect fish-shaped ice cubes. A great gift to liven up children’s beverages or add a bit fun at parties! These Sailor Moon rabbit pajamas are so cute and comfy, fans of the series just won’t be able to resist! Inspired by the Sailor Moon Rabbit (Usagi Tsukino) character, the pink sleepwear set includes a top and bottoms as well as matching pigtail bows. This anime-style magic circle charging pad is the coolest way ever to power up your phone! As soon the phone is set down, the surface’s true nature is revealed, as the mystical runes etched into it illuminate. Compatible with most smart phones! How cute is this miniature panda zen garden!? Arrange the little plants and pebbles to create a peaceful sand garden for the adorable panda bear to meditate in. Rake designs in the sand when you need to clear your mind and obtain inner peace.